A business letter (on company letterhead) stating that a passport is required for travel. This letter must signed by a representative of the company other than the applicant with an original pen-to-paper signature and must specify the applicant’s departure date(s) and destination(s). A sample is attached. Letter of Authorization, emailed separately to you after consulting a travel specialist. The Letter of Authorization (LOA) allows us to represent you to all agencies involved in issuing your passport. The signature on the LOA must be an original pen-to-paper signature in blue or black ink, and must match the signature on your current passport and your application form. No faxes, scans or copies will be accepted. All passport requests are processed by knowledgeable, experienced associates. All calls are answered by a well-informed associate. All Personally Identifiable Information is protected with safeguards that exceed State Department standards. All requests receive email confirmation acknowledging receipt. 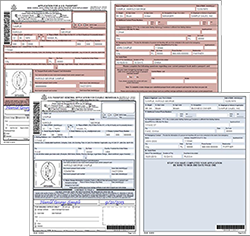 All application documents are thoroughly reviewed when they arrive in our processing center. All requests receive email confirmation of the completion and FedEx tracking information. All passports are returned via the FedEx service of your choice.